A pedestrian is any person who is traveling on foot alongside or near any street, road, or in another type of developed area. Even when you are simply walking from your vehicle’s parking spot into a building, for the time when you are traveling on foot you are considered to be a pedestrian. Because everyone is a pedestrian on almost a daily basis, most all of our local residents regularly at risk for suffering serious injuries that may require the help of a Long Beach pedestrian accident lawyer. If you are in need of a lawyer after this type of accident, Jamal Injury Law P.C. can help. In 2011, the California Office of Traffic Safety (OTS) reported that California had the highest number of pedestrian accident injuries of any state. These accidents frequently result in severe injuries that may significantly impact on your life. If your accident occurred because of another person’s negligence, you have the right to hold that person liable for all of your losses. When a pedestrian is hit by a large oncoming vehicle, they are extremely vulnerable to injury. 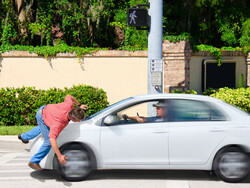 They may be thrown to the ground or bounce off the car, causing several different points of impact with the bumper, hood, roof of the car, or pavement. As you can imagine, even a collision that happens in a local parking lot can cause injuries that are serious enough to require not only medical attention, but the help of a pedestrian accident attorney experienced in the Long Beach area. At Jamal Injury Law P.C., we know from experience that many of these injuries are serious enough to require extensive medical treatment, which can cause overwhelming medical bills to pile up. Victims also often lose significant income because they must miss work during recovery. Furthermore, many victims are left with permanent disabilities or disfigurements that may keep them from ever returning to work or independent living. Even if you suffer relatively minor injuries in your pedestrian accident, you have the same right to recover compensation as someone who suffered more serious injuries. No matter what type of injuries you sustained, you should always get in touch with an experienced Long Beach pedestrian accident lawyer to discuss how you may recover. If you have suffered injury in a pedestrian accident, you are likely facing a difficult physical recovery, as well as financial trouble that has stemmed from medical bills, missed work, and more. Additionally, your injury may have caused pain and emotional hardship on you and your family. If this happens to you, your first step should be to protect your health by getting immediate medical treatment, even if your injuries seem minor. After you have visited your health care provider, it’s a good idea to contact an experienced personal injury attorney. It’s best to work with a nearby lawyer as this will make in-person visits much more convenient. At Jamal Injury Law P.C., we understand the struggles you are facing and are committed to helping you receive the full compensation you deserve. Do not hesitate to contact our office today at 714-907-1021 to schedule your free, no-obligation consultation with a pedestrian accident lawyer in Long Beach.